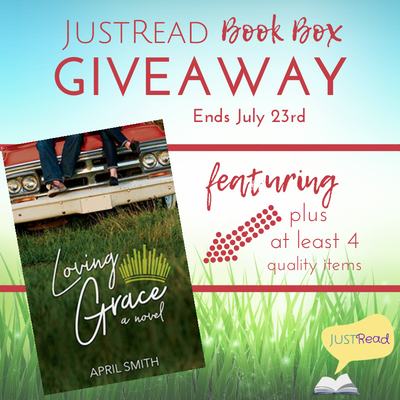 Welcome to the Loving Grace by April Smith blog & review tour plus giveaway, hosted by JustRead Publicity Tours! “Mom, you’re making her nervous,” Bennett says, thankfully interrupting anything else she was going to say. “We’ll see you in the conference room for your speech,” Mrs. Baron says. I give them a thumb’s up and head into what is supposed to be finger foods and light conversation. What I find is each girl working the room and chatting with each judge individually. It’s like that trash TV speed dating show, where everyone gets five minutes with their possible date, and then they have to switch. People on the show are aggressive and pushy—only it’s worse than that in here. I fight the urge to become a wallflower and head over to the first available judge I see. “Hi. I’m Grace Summer.” I grin before offering my hand for a handshake. (1) JustRead Summer Fun Book Box, which features Loving Grace as well as at least 4 quality items which complement the story. Find out more here. Enter via the Rafflecopter giveaway below. Giveaway will begin at midnight July 16, 2018 and last through 11:59pm July 23, 2018. US only. Winners will be notified within a week of close of the giveaway and given 48 hours to respond or a new winner will be chosen. Giveaway is subject to the policies found here. Check out the tour landing page at JustRead for the full schedule!